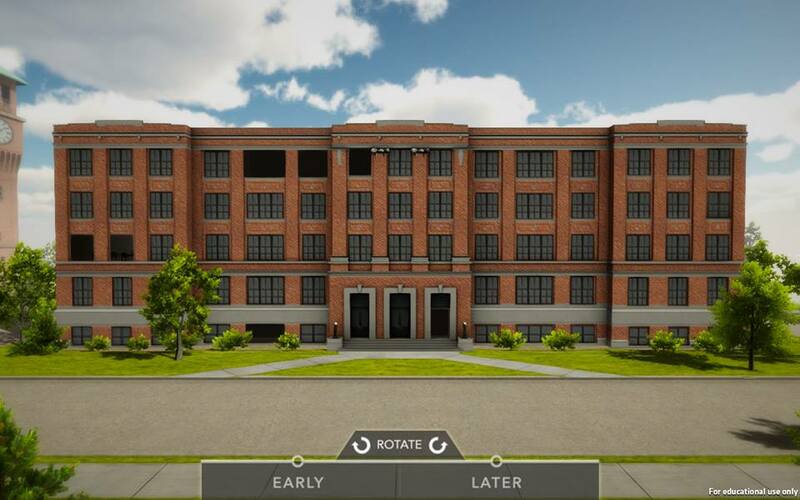 It seems like Fall 2014 was just yesterday and the Digital Humanities seniors and Design Animation and Modeling III class were merely brainstorming ideas for what would soon become Harvey; a virtual and interactive representation of UW-Stout’s Harvey Hall. Now, 6 months after the project officially ended, I turn to Brittany Zimmer, one of the graduates from the Digital Humanities concentration, to reflect on the pros, cons and various aspects of the project. Marisa: What did you like about the creation process of Harvey? Brittany: My favorite part about the Harvey Hall Project was taking a huge step outside of my comfort zone. Not only had the Digital Humanities students never worked on such a huge research project before, we had also never worked with such a vast array of people outside of our program. Getting to meet the students that actually designed and developed the game, and the in-game videos was so much fun. 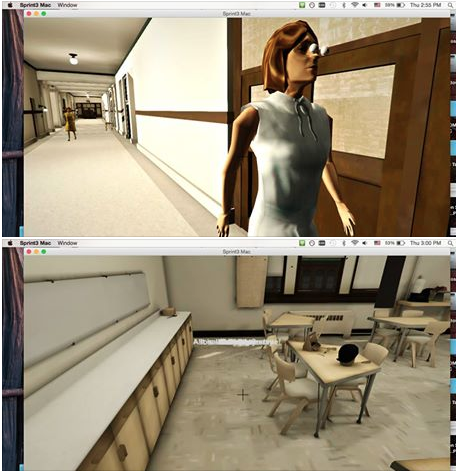 I never thought that I would take an interest in designing video games, but watching the students who were studying to become professionals in that field was really eye opening. It changed the process from being semester full of tedious research to something fun, tangible, and exciting. M: On the other hand, what was challenging about the process? B: My least favorite part about the Harvey project was the confusion it brought. Before we really dug our heels in and understood our separate roles in the game development process it was total chaos. We did not have a good way to keep track of our research and the weeks started to blend together in their similarity in that we were told to go to the library and find old pictures. The problem was that no one really knew what they were doing yet and although that was definitely a huge part of the project, and a lot of the fun as well, we certainly didn’t know it at that point. The uncertainty and misunderstandings in the beginning definitely set us back. M: What would you say is your favorite part of the Harvey game itself? B: My favorite aspect of the Harvey Game is the realism that the Digital Humanities students built into it. Everything is based off the original 1916 and 1950 eras. The music, clothes, classes, even the building reflects all of the research that was done and helped make Harvey more than a game. It’s an experience for people to take advantage of and learn about their school, as it was when it was just getting started. And the wasps. I cannot forget about the wasps. M: The wasps are my favorite part too! Well there you have it. Research, chaos, wasps, and much more went into Harvey’s creation. See it for yourself at the 2016 Independent Game Festival! If you cannot wait that long, Harvey will be available for download in early 2016! In order to create a truly immersive game, we have to draw users in and make them feel like they are part of something special. One way to do this is to give a voice to our characters, and no character is more important than the main man himself, Lorenzo Dow Harvey! L.D. Harvey is the first character players encounter during their gameplay. He introduces them to the game, informs them of its purpose, and gives them direction. This introduction is arguably the most important aspect of the game because without it, the user would be lost. Since it is so important, we needed to create enticing dialogue and find the perfect voice to play L.D Harvey. A special dialogue team was created in order to write for L.D Harvey. The team was comprised of Henry Barbee, Lauren Brooker, Nick Goodsell, Jace Johnson, and Sara Westman. While they were in charge of creating Harvey’s words, Professor Kevin Pontuti found the man who performed Harvey’s voice. This is where Steven Alm comes in. Alm is a professional voice actor, musician, and husband to the beloved dean of our college, Maria Alm. Kevin Pontuti was aware of Steven’s past work and knew he could deliver L. D. Harvey’s stern yet endearing voice. The process was simple. Kevin sent Steven the script, and Steven sent back a test recording. After exchanging notes, Steven was able to craft the voice of L. D. Harvey. In two smooth recording sessions, Steven had recorded all of Harvey’s dialogue. The audio team edited the audio footage and passed it to the animation team—along with accompanying video of Steven’s face that was shot during the recording. Kyle Field painstakingly animated Harvey’s lip and facial movements in synch with the audio, referencing Steven’s natural facial expressions as he performed Harvey’s voice. This lip synched animation is part of the introductory animatic sequence—written and developed by Nick Goodsell, Henry Barbee, Jacob Bloom, and Lauren Brooker—that transitions the user to gameplay from our live action introduction into the game. Bringing Harvey to life has been another satisfying part of the Harvey project. We hope it helps our users to connect with history and immerse themselves in the Harvey world. To witness the product of this hard work, and to get your hands on the game itself come to the Game Launch on May 5th! 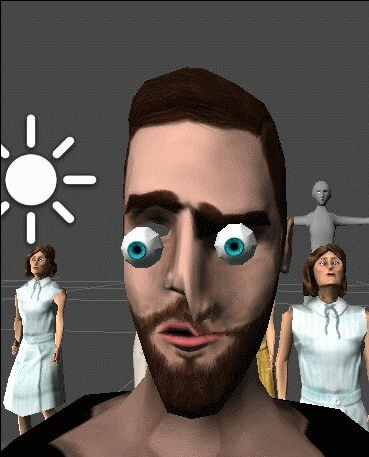 So far we’ve always been on the ready with exciting updates, new breakthroughs, and professional screenshots. But it’s not always sunshine and roses with the development process. This post is going to be a short bloopers reel to share some of the funny and constant roadblocks that we’ve encountered along the way. This poor student is supposed to be sitting at a table in the library and studying. 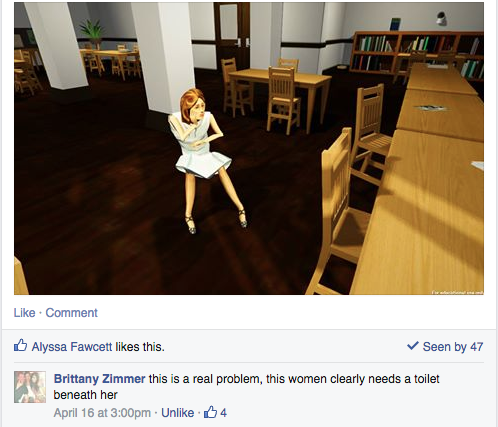 Instead, we take screenshots during playtesting and write witty comments. The above picture is repeatedly the situation that we have found ourselves in. We make, test, and re-make objects over and over again until we get them right. Sometimes we get errors when handing files from one team to another, or actually implementing them into the Unity game engine. It’s been a bit like herding cats. Sometimes the objects react in completely unpredictable ways, like the characters’ eyes flinging out of their heads on every second step. Or sometimes the bone structure of the characters just wasn’t implemented in the proper hierarchy, so things get a little bit strange when we test out the animations in the game engine. For better or worse, though, it’s all part of the process of fine tuning all of the characters and animations of the game. We hope you enjoy a few of our struggles along the way. In the top photo, this character’s eyes shoot out of her head ever other step; have no fear, though, because they always come back. In the bottom photo, we just have overlapping text. Who, and what, is in the line-up? The countdown for the release of Harvey has begun. So as we head into the final two weeks, we thought it was time for the complete show-and-tell. The character artists have been nose-to-the-grindstone all year, and we’re proud to announce that Harvey is going to be quite a diverse environment. We have a great line-up of historical characters: Minnie Becker, Stout Secretary; Bill Neubauer, elevator operator; L. D. Harvey, first president of Stout; Lillian Froggatt, head librarian; Mary McCalmont, chemistry teacher; Verne Fryklund, third president of Stout; and Cal Peters, artist-in-residence. As for background characters, though, you’ll see more than 30 different characters wandering the halls and filling the classrooms. We’ll have fresh faces and tons of background chatter to keep the Harvey environment new and interesting. 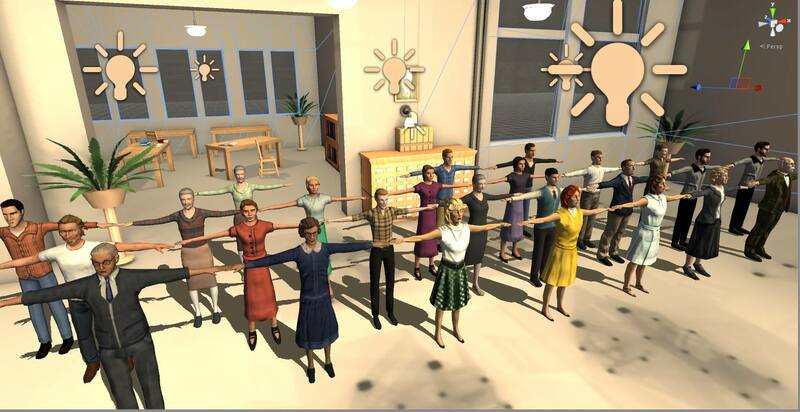 The classroom and environments line-up is even longer. We have 10 rooms and hallways fully populated with characters, objects, and games ready for you to explore. On this 10 room list is the theater, President’s office, textile room, sewing room, millinery classroom, library, tea room, food lab, chemistry lab, and Cal Peters’ studio. Hello! 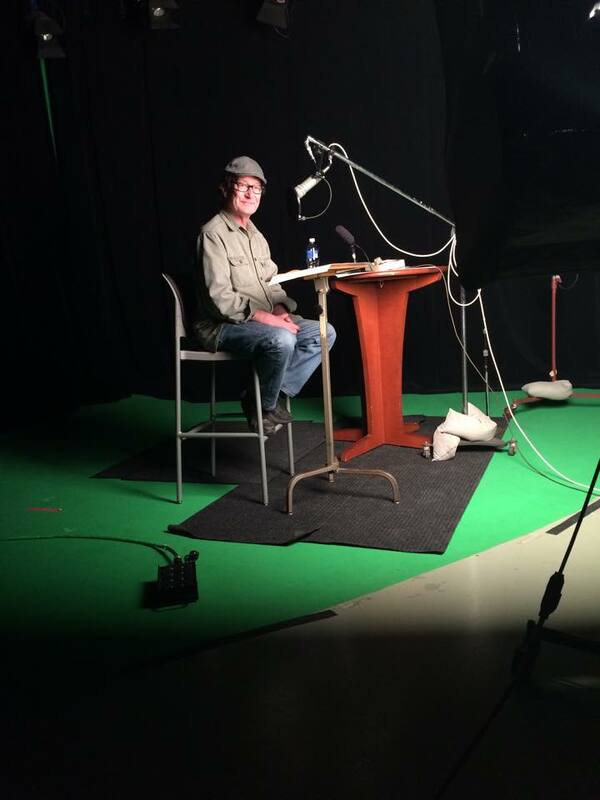 We’ve been hearing a lot about what the 3D artists and digital humanities students have been up to lately but not much about our digital cinema students. This post, written by Ava and Rachel, brings us up to speed. 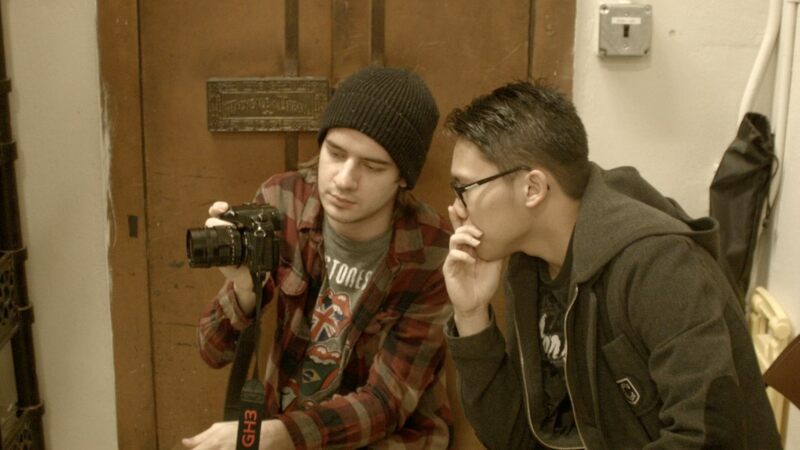 Digital Cinema students Tyler Anderson and Tony Pha reviewing takes. The creation of a work of film is separated into many stages. Speaking most generally these stages are pre-production, production, and post-production. Over the course of two months, we have worked heavily on the pre-production stage, including location scouting, storyboarding, creating wardrobe and prop boards, as well as blocking out shots on location. In a concentrated story form like we are creating for the beginning of the Harvey Game, this stage is essential. Since we are shooting on an off-campus location, the Mabel Tainter Theater, communication between the teams, within our team, and to those at the Tainter, all have to line up and be worked out before anything can be done. The first time we are able to work on set, different challenges became immediately clear. 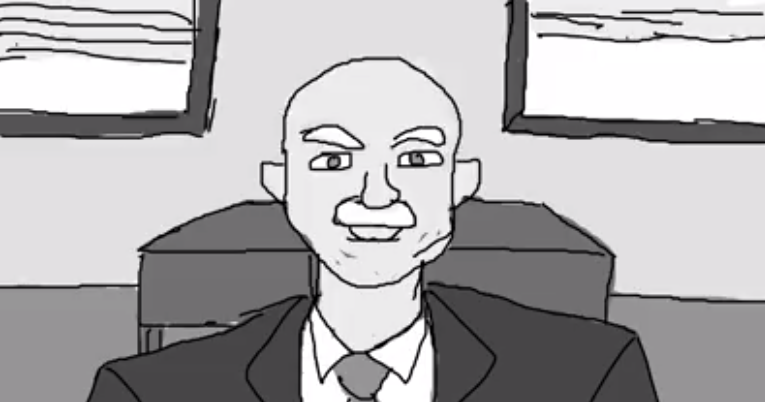 From our initial storyboards, we had a clear idea of how our video would look, but often it’s a bit more difficult to actually create these ideal images. The spaces within the Tainter also posed interesting problems to solve. For example, the “Rare Book Section” is actually a few closely-packed shelves in a back room. Sometimes our initial storyboards had to be tweaked, or we came up with new ideas on the spot. The most frustrating part of filming is actually the communication stages. Having everything planned, yet waiting for the “Okay” is difficult to have patience for, but is worth it in the end. Sara Westman temporarily acting as the protagonist for the short film; pre-production is painstaking. Our next steps will be to shoot the final version of the film with our actress, and then work on the post-production stage. This will include a lot of color correction, as well as some digital compositing of shots to really give the feel to the library we’re looking for. 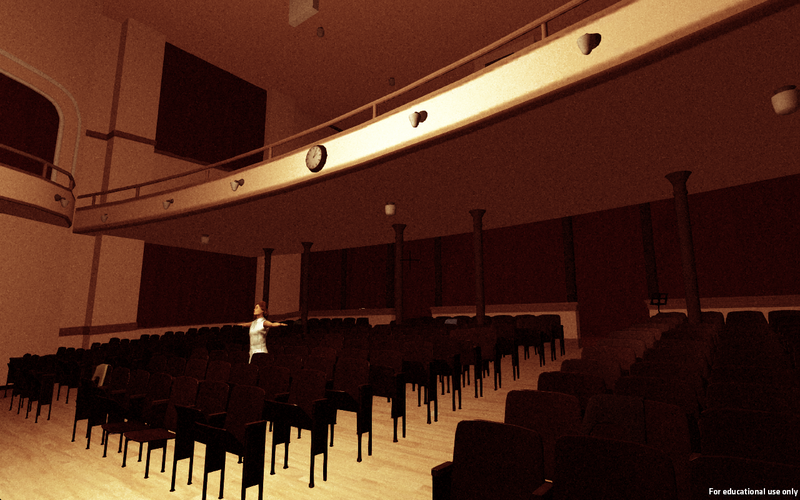 Sound design will also come into this stage, as sounds will be added and edited, and some music potentially added to heighten the mood. We’re looking forward to seeing our short film integrated into the Harvey Game. Last week the Harvey Digital Humanities team participated in the annual Re:Humanities conference hosted by undergraduates digital humanists at three liberal arts colleges in Philadelphia (Bryn Mawr, Haverford, and Swarthmore). The conference included the work of students from diverse schools, including UCLA, Yale, Princeton, and Queens University (Ontario). 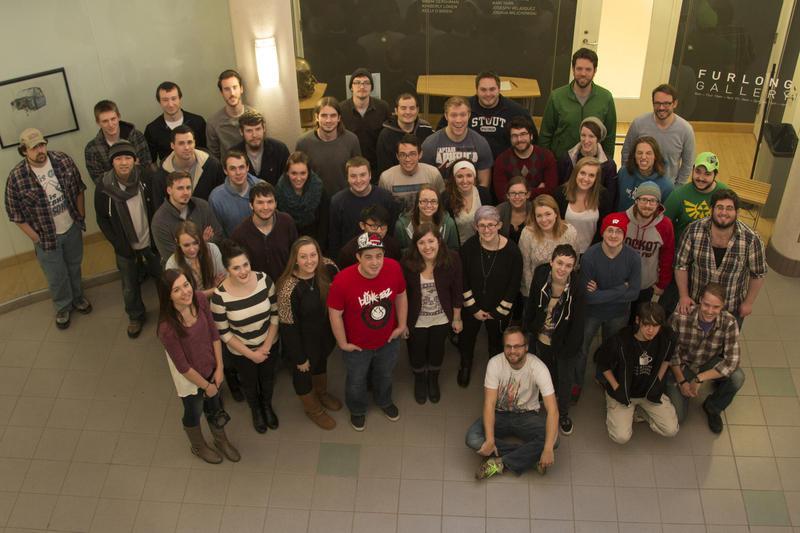 These students brought their biggest and brightest ideas to showcase a wide range of digital humanities projects. An image from Hillary Cleary’s (UCLA) historical game “Pope Burn: A Game for Dissenters,” which highlights a little-known 17th century pope-burning processional. The projects included Hillary Cleary’s “Pope Burns” game which details the historic events behind a 17th-century London processional that culminated by a crowd burning the pope in effigy. Cleary created this game for the same reasons we are building Harvey: as a way to curate the past and educate the public on the events of the past. And she wanted to create something rather than write another twenty-page paper. 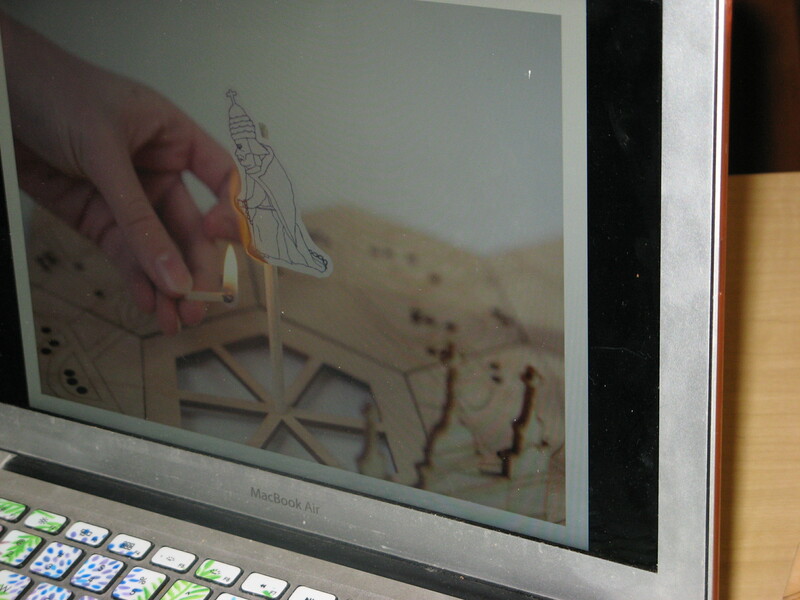 The spirit of maker culture animated the student projects. It is an exciting time to be a student. Whitney Trettien, who will be starting as a new professor at UNC-Chapel Hill, kicked off the two-day event with a keynote address exploring the multiple ways that objects can be immortalized and how this benefits those of us who take the time to stop and look at them. Her speech “Destroying the Book to Come” gave examples of how old books have been digitally awoken—giving their messages and ideas new life. That’s what we hope Harvey does for the content that is trapped in the archives. In the same way that Trettien beautifully introduced the conference, Wendy Hsu’s closing keynote wrapped it up in a way that made us all step back and look at our digital humanities world in a different way. “Enacting Humanist Possibilities: From the Academy to the Publics” contemplated how these new, digital technologies can change the ways that our public institutions—schools, universities, municipalities—engage the general public. Hsu imagines a deeper involvement of citizens and ordinary people in public work. 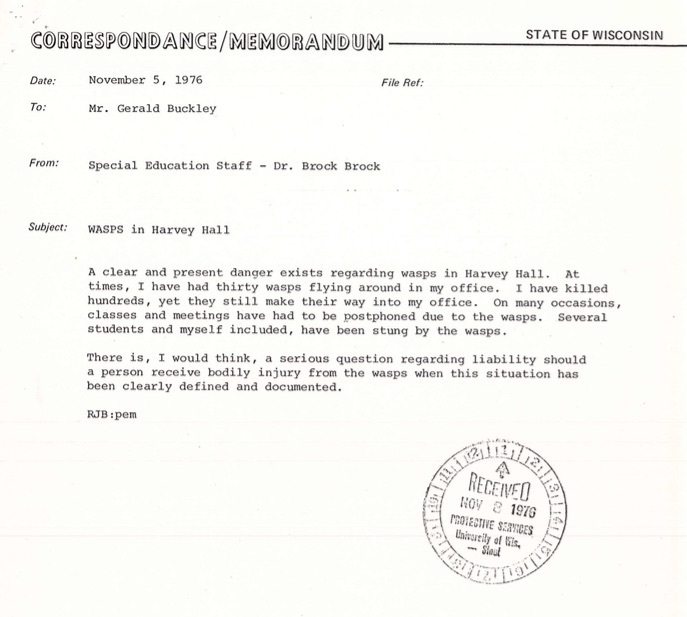 Looking at the community of western Wisconsin and UW–Stout alumni, Harvey has similar goals to create a new way for people to interact with this institution and our shared history. Throughout the conference The Harvey Game sparked interest across the board. The chance to present this project at the poster session really caught everyone’s attention and made them think about a whole new way to represent the Digital Humanities. 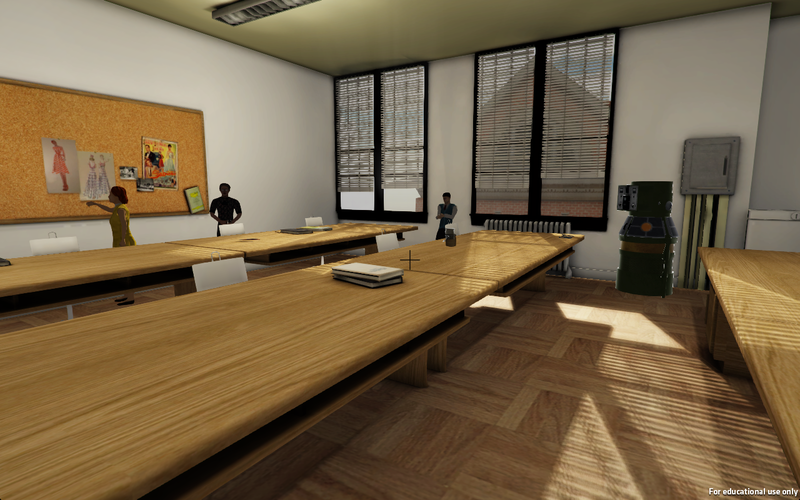 With many comments along the lines of “I never would have thought a virtual game could be a humanities project.” The Harvey Game really represented the amazing and innovative work that The University of Wisconsin – Stout is instilling in its students. We can’t wait to see what comes next. A group selfie with the student presenters. So whose in our lineup for new characters in Harvey? How about a heartwarming, German speaking, advice giving, jovial little man named Bill! Bill is the one that looks more dapper than the rest. 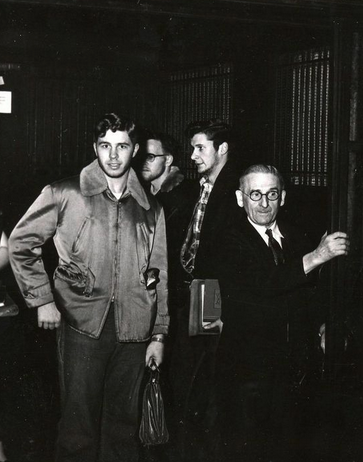 William (Bill) Neubauer started his career at the Stout Institute in 1931 as a 30-day temporary elevator operator. 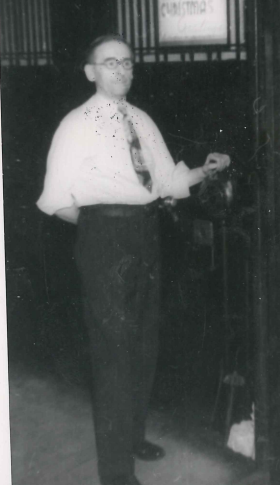 The first 30 days seemed to work out quite well, so Bill carried on as the Stout Institute’s elevator operator for the next 23 years, finally retiring in 1954 when an automatic elevator was installed. He didn’t have any hard feelings about it, though. Bill was very well known and admired by the students. According to Stoutonia newspaper articles and many students, Bill was always happy. The daily elevator riders always looked forward to his cheery conversation, hearty greetings, and his even disposition. He is remembered as one who was always willing to help students in any way that he could. He always gave great advice. Bill had moxie. His frequent greetings in German led many students to believe that he grew up in Germany, but he actually moved to America by the time he was two years old. Old Bill perfected his German speaking skills in Wisconsin. Some of the most mind-boggling aspects of Bill’s career at Stout are his estimations of the number of students he has transported in his trusty elevator. Bill himself estimated that every day he would travel roughly 8 miles in his elevator. He made between 500 and 600 trips every day, and each trip averaged 6 passengers, bringing the total to about 3,600 passengers daily. Over the duration of his career, Bill estimated that he transported 15 million passengers over the course of 48,000 miles.